Staring in the colourful city Valparaiso, we sail along the Chilean Pacific coastline that is filled with snow-tipped volcanoes that is reflected in beautiful lakes, raging rivers and lush vegetation. The vastness and untouched beauty of the rugged and mountainous landscape will surely make a great impression! We continue one of the most scenic national parks in the world and into the fjords of Chile. This wild and remote area seems almost untouched by humans, with mountains plunging into icy waters. The steep valleys with snow-capped mountains make a striking contrast to an otherwise green area that is rich so in wildlife. Cape Horn is a mystical place where to oceans meet. We might even go ashore here. Further, we will be crossing of the treacherous Drake Passage to Antarctica to the mighty frozen wastes of the south. In Antarctica we will attempt to do landings at several places. Penguins, seals, whales and large flocks of sea birds give life to this surrealistic and beautiful landscape. We will bring you on shore to experience some of the most unique wildlife viewing while setting foot on the Antarctic continent. You might also get a chance to kayak in the icy waters of Antarctica. And while on board our comfortable ship you can hear presentations by experts in Antarctica’s rich history, so that you can get even more out of what you will experience along the way. Then we cross the Drake Passage again, before this expedition ends in Ushuaia. Please Note: your voyage prices include economy flight Ushuaia to Buenos Aires. This expedition starts in the wonderful, colourful and poetic city of Valparaíso. One of the best ways of seeing this scenic town is through its funiculars. These constructions, which are scattered around the entire natural amphitheater surrounding the city, allow sweeping views of the bay, and highlight the multi hued houses, creating a rainbow of color and light. Stroll Valparaiso´s narrow streets, climb its endless staircases and discover something new at every turn: a beautiful building, a remarkable art gallery or some little gastronomic ‘find’. Don’t forget to explore the port and fishing piers, where you’ll get a real feel for Chile’s quirky seafaring side. Buy or sample freshly caught seafood at the market and enjoy the fishermen’s banter. We also recommend a visit to the UNESCO-listed Historic Quarter before embarking on MS Fram. As we make our way along the Pacific coast of Chile the expedition team will start the lecture program to prepare you for the experiences ahead. Enjoy priming your knowledge about the history and wildlife of the area. There will also be various workshops and presentations. Make sure to spend some time on deck to enjoy the fresh sea air and look out for wildlife. Familiarize yourself with our expedition vessel and take advantage of all the facilities on board. Located on Isla Grande de Chiloé, Castro is set among windswept hills and green vegetation. The city is known for its colourful “palafitos”, wooden houses mounted on stilts along the water's edge. Come ashore and enjoy the local Chilote character and curious energy, mixed with a dash of modern development. The Iglesia San Francisco is a UNESCO World Heritage Site. The church is a visual delight: bright yellow and orange with a lavender trim. The varnished-wood interior is stunning. On a sunny day it is illuminated by the rows of stained-glass windows. Other sights include Plazuela del Tren a small plaza right by the waterfront with an odd collection of old trains. A stroll in the Cementerio Parroquial is actually pleasant. Some of the tombs here are quite grand and ornately decorated. Feria Campesina Yumbel is a bustling fruits and vegetables market. There are also household goods and fish stalls here. In the shop Feria Artesanal Lillo, located just south of the port, you can buy excellent hand-knitted woolen goods and handicrafts. Most of the restaurants and cafes in Castro are concentrated along the Calle Blanco, running from the southern end of the plaza down to the waterfront, this is where you can get a taste of the renowned meat, potato and seafood stew. Join the excursiuon to the Chiloé National Park and go trekking in this evergreen forest. The area is largely unexplored by man and harbouring flora and fauna unique to the archipelago, as well as wide deserted beaches and long stretches of rugged coastline, home to dozens of seabird species, penguins and sea lions. The expedition continues south through the fabled waters of Patagonia and onwards to one of the world’s most remote, undisturbed and beautiful places: the southern province of Ultima Esperanza, meaning Last Hope. We are sailing through iconic Andean seascapes and you have plenty of time to gaze out on the glassy expanse of nature uninterrupted. There might also be trivia contests covering questions about explorer history and Antarctic wildlife. We might also hold auctions to raise money for specific causes. These on board auctions have contributed to the most ambitious habitat restoration project on Earth; South Georgia, protection of the Albatross and maintenance of research stations in Antarctica. With the help of our guests, we will continue to raises funds and awareness of opportunities and challenges in the areas we visit. After an unforgettable cruise through the Patagonian waters, the unique village of Puerto Edén will enchant you. It is a tiny village in Bernardo O’Higgins National Park. Puerto Edén is known for its geographical isolation, situated at the end of a deep fjord and surrounded by mountains. Its population of 250 people includes the 15 remaining members of the Kawéskar people. Puerto Edén is a great place to experience the traditional indigenous culture of Patagonian tribes. The villagers sell fish, mussels and shellfish products, which are taken to markets by a weekly transport boat. For souvenirs, buy traditional Kawéskar crafts such as wicker baskets and boats made from sea lion skins and tree bark. Enjoy a stroll among the laneways, and maybe you will spot one of the many Magellan hummingbirds that you find here when you join the expedition team for hiking or kayaking. Puerto Natales is the gateway to the world-renowned Torres del Paine National Park, one of the most attractive national parks in the world. Its main attraction, the “towers” themselves, is the impressive rock formation, both colossal and unique, called “Torres del Paine” (Towers of Paine). The towers are made up of the Torre Central (9,186 feet high), Torre Sur (9,350 feet) and Torre Norte (7,375 feet). The park encompasses azure lakes, trails that meander through emerald forests, roaring rivers you'll cross on rickety bridges and one big, radiant blue glacier. Variety spans from the vast openness of the steppe to rugged mountain terrain topped by looming peaks. This diversity of environments here has led to a very rich fauna and flora. While we are here you might see llamas, pumas, chilla foxes and skunks in addition to more than 100 species of birds like the Andean condor and black-chested buzzard eagle. Enjoy hiking in these amazing surroundings. The Chilean fjords will excite nature enthusiasts with its channels, fjords and mountains plunging into the icy water. This wild and remote area seems almost untouched by humans. The ice has scoured its way between the mountains, creating the isolated islands and hidden bays that form the unique fjord landscape of Chile. The snow-capped mountains and steep valleys make a striking contrast to an otherwise very green area that is rich in wildlife. 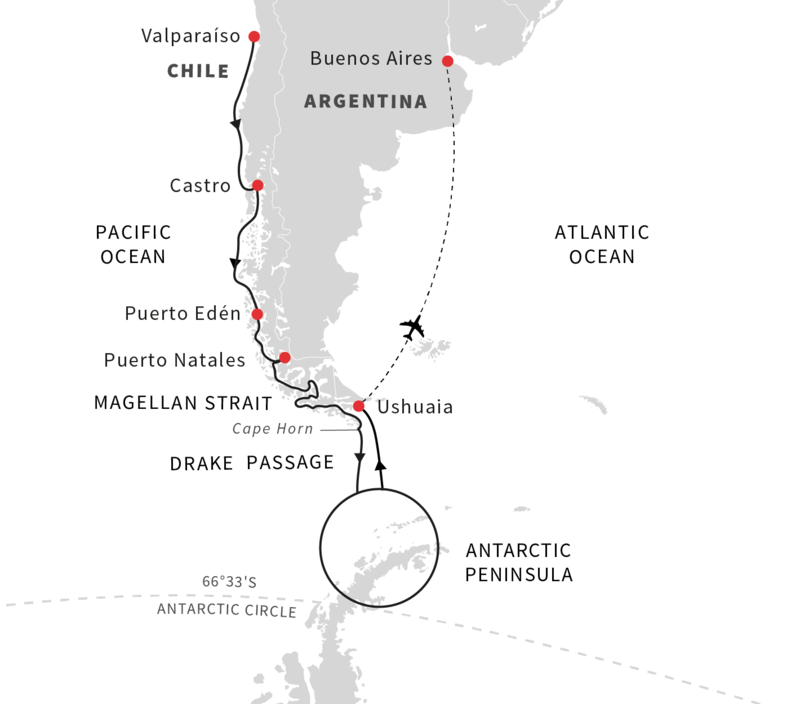 In the morning we will be sailing through the Beagle Channel, named after the ship that carried Charles Darwin on his voyage of discovery – HMS Beagle. We continue into open waters, and if conditions allow we will make an attempt to land on Cape horn – the southernmost tip of South America. Going ashore can be very difficult because of the sometimes-extreme weather in this area. This is the southernmost point of Chile and South America and lies almost 56 degrees south, marking the boundary between the Atlantic and Pacific Oceans and the northern end of the Drake Passage. The region is of great significance on account of its location, history, discoveries and trade routes. If we anchor off Cape Horn, you will be able to go ashore to explore this deserted and yet romantic piece of land at the end of the world. Then we continue over the Drake Passage, where two oceans meet, on our way to Antarctica. On the way through the straits you can learn a great deal about Antarctica’s fantastic animals and history. This sea passage was notorious among the early polar explorers and is a unique voyage which only a few have the chance to experience. 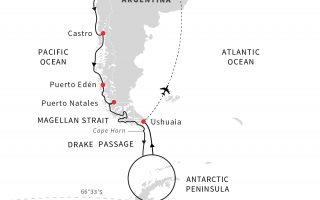 The Drake Passage connects the southern Atlantic and Pacific oceans. Here the warm water from the north meets the cold, less salty water from the south. This makes the ocean particularly rich in nutrients and is the basis of the unique marine life here. This unending, white wilderness of a continent is full of overwhelming impressions on an impressive scale. Weather, wind and ice conditions will of course have a great influence on our programme and schedule and your experienced expedition team will select possible landing sites that will provide you with the best experiences available. With long hours of daylight that we have in Antarctica this time of the year it is easy to make the most of your days. While in Antarctica, we will attempt to land on sites both on the South Shetland Islands and on the Antarctic Peninsula. Flexibility allows us to take advantage of the unexpected and wildlife will be at the forefront of our mind. We will bring you on shore for close up exploration. We might call at the Gentoo penguin rookeries on Cuverville Island and Neko Harbour. We hope to sail through the incomparable Lemaire Channel and take on the challenging hike on Petermann Island to get rewarded with panoramic views. Another fun destination if weather permits is Port Lockroy, an old British base with a museum. Sailing through the Antarctic Sound offers spectacular views of tabular icebergs and glacial landscapes, and Brown Bluff has a distinct rock formation. Our sturdy PolarCirkel boats will enable us to go ashore almost anywhere and explore bays and channels. The expedition team will explain what you see and ensure we do as little as possible to disturb the local wildlife. Enjoy experiencing Antarctica with all your senses. Kayaking in untouched waters with icebergs floating by, guided hikes up snowy pathways to spectacular viewing points, listening to the sounds of glaciers calving or penguins squabbling, spending the night on deck or in a tent on this remote and untouched continent, or perhaps for the most daring, taking the polar plunge swim. Every day will be different, carefully crafted by our expedition team to educate you and create lasting memories. 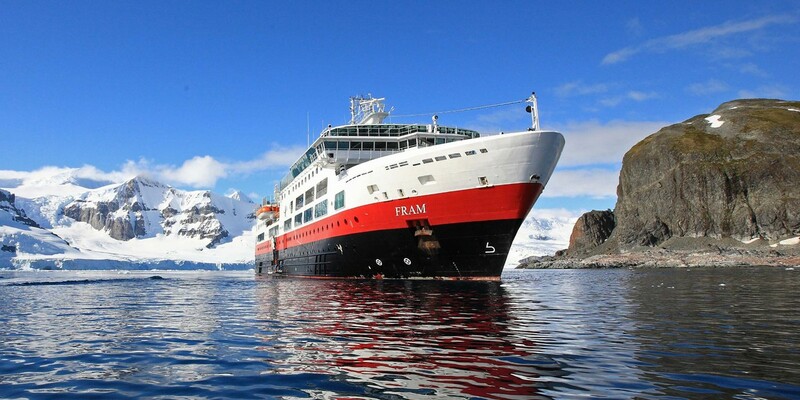 After four unforgettable days in Antarctica, MS Fram takes us safely back across the famous Drake Passage. The voyage from the Antarctic Peninsula to the southern tip of Argentina is roughly 950 km (600 mi) or 40 hours sailing time in good weather. During the voyage north, we will continue our lecture series and recap our experiences of Antarctica. Sadly, every expedition must come to an end. When we reach the southernmost town in the world, Ushuaia, it is time to say goodbye. Your journey home continues with your flight to Buenos Aires, where you have a chance to extend your stay in and enjoy our optional post extension programs. This is an expedition where the elements rule, and the weather, wind and ice conditions will determine our final schedule. Safety is paramount and the captain will decide the sailing itinerary during the voyage. Therefore, this itinerary is just an indication of what you can experience, and why every expedition with us is unique. 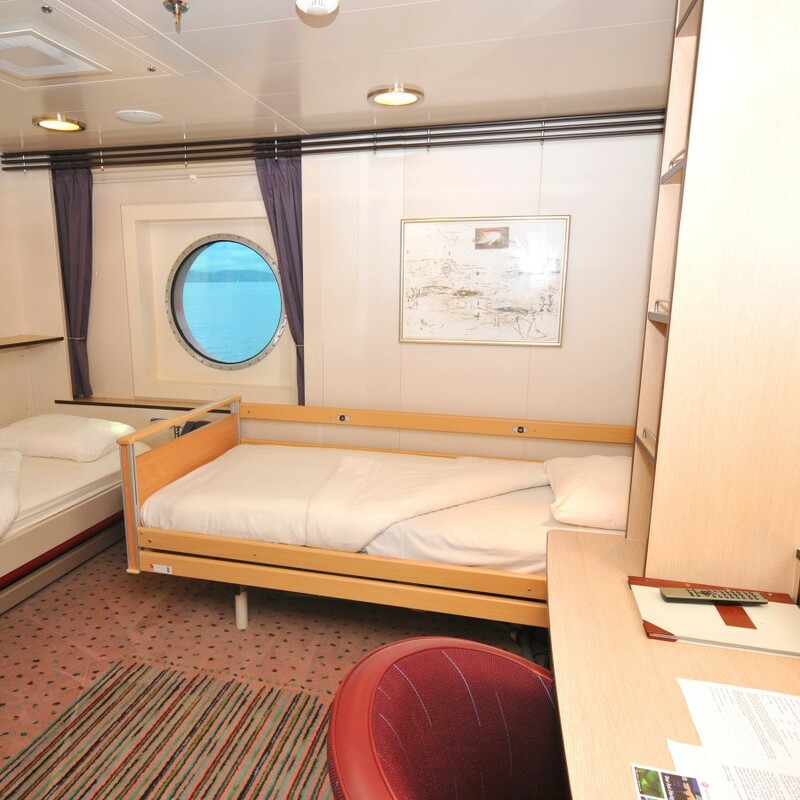 Our Polar Inside cabins are situated on lower deck and offer a cosy atmosphere. All cabins include bathrooms with shower/wc. 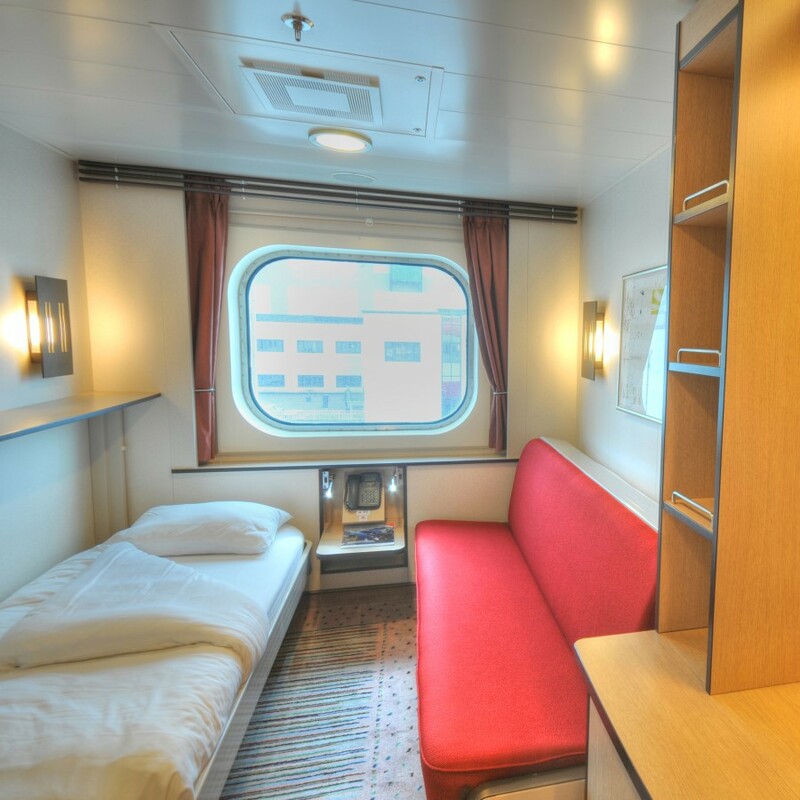 Most of the cabins have separate beds where one can be turned into a sofa, and others offer upper and lower berths. Some of the cabins have more facilities than others. Our Polar Outside cabins are situated on lower deck and they all have bathrooms with shower/wc. Most of them offer separate beds where one can be turned into a sofa, and others offer upper and lower berths. Some of the cabins have more facilities than others. Our Arctic Superior cabins are comfortable cabins situated on both upper and middle deck, where you can enjoy a relaxing atmosphere. All the cabins have bathrooms with shower/wc. 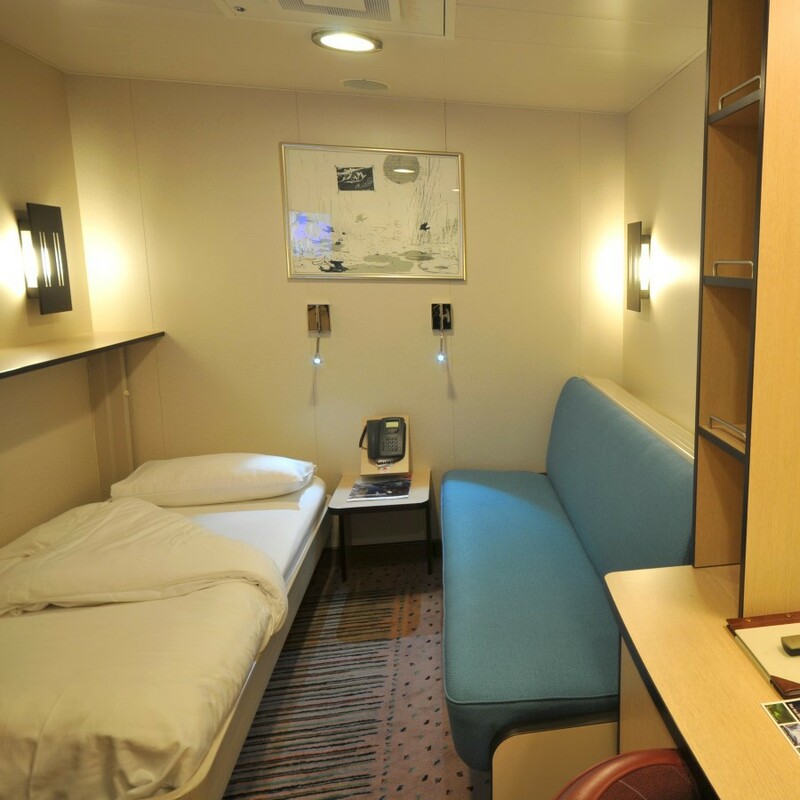 You will also find coffee and tea facilities in these cabins. Most of them have separate beds, where one can be turned into a sofa and some have double beds. Some of the cabins have more facilities than others. Our Expeditions Suites are the most exquisite cabins on the ship. 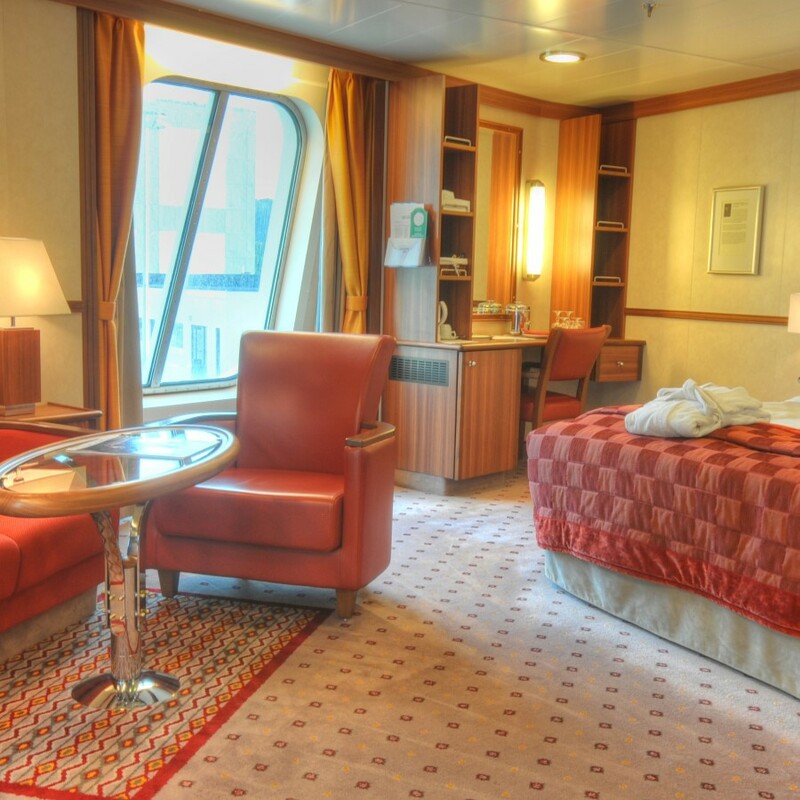 Situated on upper deck, you can enjoy the most comfortable suites on board. Inside you will find seating areas with TV, bathrooms with shower/wc and most of them have double beds. All of the suites offer cabin kits, which contains bathrobe, slippers and other beauty articles. Some of the suites do have more facilities than others.